Programs that seek to increase women’s participation in marketing activities related to the principal household economic activity must involve men if they are to be successful. 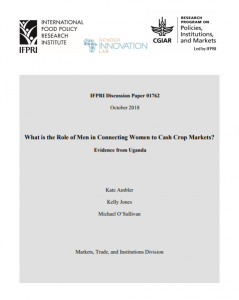 The authors of the new IFPRI Discussion Paper Kate Ambler (IFPRI), Kelly Jones (Institute for Women’s Policy Research and American University), and Michael O'Sullivan (World Bank's Africa Gender Innovation Lab) analyze take-up of a project that sought to increase women’s involvement in sugarcane marketing and sales by encouraging the registration of a sugarcane block contract in the wife’s name. They find that men who are more educated and live in households with higher wealth and expenditures are more likely to agree to the registration. Households with more cane blocks and in which the wife is already more involved in cane activities are also more likely to participate. Overall, take-up is high at 70%, and remains high even in those groups that are less likely to take-up. Additionally, the study shows that blocks transferred to women are not of lower quality or value than those kept by men, though they are smaller and closer to the home. These results suggest that simple encouragement can be an effective tool to nudge men to include their wives in household commercial activities. CGIAR Research Program on Policies, Institutions, and Markets, and the IFPRI Strategic Innovation Fund. 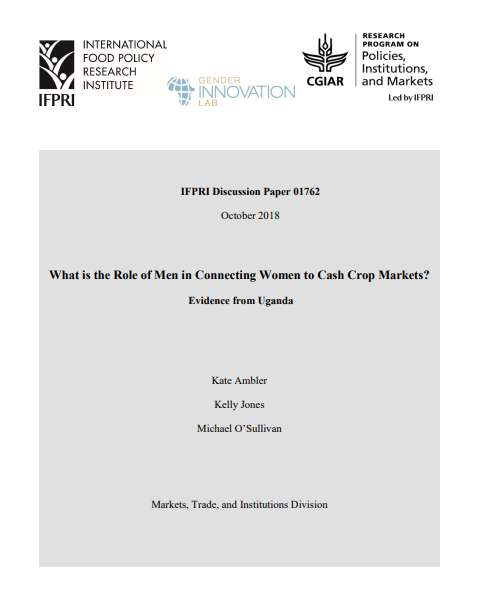 This work forms part of PIM's Flagship 6: Cross-cutting Gender Research and Coordination, cluster "Gender, Agricultural Productivity, and Rural Transformation."